The US and EU are on the brink of a full-on trade war with China over the alleged 'dumping' of cheap solar panels. The US has already levied punitive tariffs on Chinese panels and the EU looks set to follow suit. As China launches anti-dumping investigations of its own, Chris Lo investigates the cause and implications of the dispute, and asks if this volatile situation could hamper solar development as a whole. 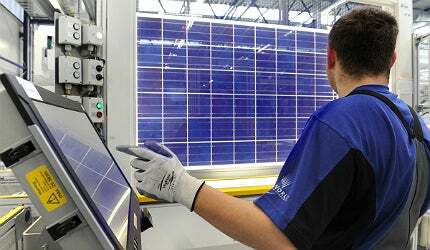 Many European and US solar panel manufacturers say they can't compete with China's heavily subsidised industry. Image courtesy of SolarWorld. The US has levied heavy tariffs on Chinese solar cell imports to prevent the 'dumping' of panels at below production cost. Image courtesy of Suntech. Both China and the West have supported their domestic solar industries with soft loans and subsidies. Image courtesy of Suntech. Suntech founder Dr Zhengrong Shi has warned against what he describes as "the shackles of myopic protectionism". Image courtesy of Suntech. The growth of solar installations could be threatened by price rises as a result of punitive tariffs. Image courtesy of Suntech. As the world continues to look to the sun, wind and waves to harness sustainable and eco-friendly sources of energy, alternative power technologies are developing at an impressive pace. While these technologies still have a way to go before they’re able to provide power with the necessary efficiency and volume, the main obstacle to renewable energy often lies less in technology and more in the realities of free market economics. The current stand-off between China and the West over the alleged ‘dumping’ of solar panels is a good example. Large-scale production of solar panels – especially in China, the world’s largest exporter of the devices – has brought prices down, but for many manufacturers this isn’t a sign that solar is a more viable mode of power generation than ever before. It’s a major problem. On 8 November, the European Union announced that it was opening an investigation into Chinese imports of solar panels to Europe at prices that are up to 80% below the cost of production. The price of imports has won Chinese manufacturers a huge portion of leading markets such as Europe and the US, as well as allowing them to dominate over domestic European and American solar panel makers. A global green tech market that should be the epitome of collaboration and sustainable development is now degrading into something perilously close to a full-on trade war. The market numbers speak for themselves – in the US, Chinese companies have secured more than half of the market for solar panels, amounting to sales of $3.1bn. In Europe, Chinese imports represent 80% of the European solar products market "from virtually zero only a few years ago", according to European trade body EU ProSun. The principal allegation from manufacturers in Europe and the US is that China has been heavily subsidising its solar panel industry, propping up companies so they can afford to flood the market with artificially cheap solar panels. As Chinese companies have gained, their international competitors have started to shrivel under the pressure. According to estimates from Bloomberg New Energy Finance, China’s solar manufacturing industry jumped from 40% to 68% of global solar panel production between 2009 and 2011. European companies have dropped from 19% to 12% of market share in the same period, while the US’s share has plummeted from 23% to just nine percent. "The price of imports has won Chinese manufacturers a huge portion of leading markets such as Europe and the US." The prices are leading slowly but inexorably towards a Chinese monopoly on the market, and the West is now responding. The EU investigation, prompted by a complaint by EU ProSun, which represents 25 European solar panel companies, follows anti-dumping tariffs on Chinese imports implemented by the US after an investigation by the Department of Commerce. The tariffs range from 24% to 36% for the 61 major Chinese companies that co-operated with the department’s investigation, with all other solar cell imports from China slapped with a massive 250% charge. Unsurprisingly, the Chinese Government is unimpressed. State officials have argued that supporting solar power development is a major pillar of the country’s 2011-2015 Five-Year Plan, and that the West has actively encouraged Chinese development of renewable energy. The country’s industry has accused Europe and the US of protectionism and of impeding global solar development as a whole, lodging a complaint with the World Trade Organisation (WTO) about the tariffs in early November. The West’s investigations into Chinese solar subsidies have also prompted the country to focus its gaze on the subsidies of its accusers. China’s Ministry of Commerce is currently launching its own anti-dumping investigation looking into the alleged dumping of polysilicon, used in the manufacturing of solar panels, imported from the US, South Korea and the EU. The overcapacity of polysilicon has had as disastrous an effect on Chinese polysilicon production, as China’s exports have had on solar panel makers in the US and EU, with 80% of Chinese polysilicon manufacturers now out of business. Chinese subsidies: an unfair advantage? The dispute has exposed a chaotic web of accusations and counter-accusations, conflicting interests and endless debates on the legitimacy of state subsidies. State-level support for solar power and other renewable energy projects is as well-established in the US and Europe as it is in China, after all. "EU ProSun argues that China’s support of its solar industry is creating an artificial and unsustainable market." But organisations like EU ProSun argue that China’s support of its solar manufacturing industry strays beyond economic stimulation and is creating an artificial and unsustainable market. A ProSun statement released after the announcement of the EU anti-dumping investigation claims that Chinese solar cell companies are being saved from bankruptcy by the government so they can continue to ramp up production. According to the statement, leading Chinese solar panel producer Suntech made losses of more than $1bn in 2011 but still managed to increase production in 2012. The statement also alleges that LDK Solar was bought out by the Chinese Government after losing more than $250m in the first quarter of 2012. "Chinese state banks have pumped cheap money into what should be bankrupt companies who have then flooded the EU market with dumped solar products," said EU ProSun president Milan Nitzschke. "Just one state bank of many, the China Development Bank, gave €33bn in cheap credit lines to 12 Chinese solar companies since 2010. Chinese cities such as Wuxi have propped up lossmaking local solar manufacturers with billions of euros to keep them exporting to Europe. Our technologically advanced solar industry can compete with any free market company in the world but not the People’s Republic of China." Are solar subsidies worth the cost? In a September guest post for the Financial Times, Suntech’s founder, executive chairman and chief strategy officer Dr Zhengrong Shi argued against the US and EU trade barriers on the grounds that they would increase the cost of solar power, thus hampering its development as a whole. According to Swanson’s Law, he maintained, the cost per watt of solar power drops 20% every time solar panel production is doubled, and prices tend not to rise again after they have come down. "In the absence of a meaningful global commitment to reducing greenhouse gases, let’s start by getting together and freeing the solar industry from the shackles of myopic protectionism," Shi wrote. "All countries should provide wide open market access and consumer-side incentives to promote the adoption of the best solar products available – no matter where it is made." There is clearly merit to Shi’s reasoning. Solar power is a technology of global significance, and it could be argued that its rapid development as a cost-effective alternative to fossil fuels is more important than endless bickering over where solar panels are made. "China’s cheap solar panel exports have proved to be a major boost for solar panel installers in the US and Europe." And the development of solar power shouldn’t only be seen from the perspective of manufacturers. China’s cheap solar panel exports have proved to be a major boost for solar panel installers in the US and Europe as prices come down, making commercial and residential installations more affordable. Solar installation is now an $8.4bn industry in the US, with more than 2,000 companies now installing panels around the country. US installations, which jumped by 109% in 2011, are primarily being driven by the falling cost of photovoltaics. But now that the American tariffs on Chinese imports have come into force, many companies that were planning to start a new wave of recruitment are holding off to see if their Chinese suppliers raise prices to compensate. With more than half of the US solar industry’s jobs in installation and only a quarter in manufacturing, jeopardising this sector of the industry could cause more damage to the American solar industry than allowing the cheap imports to continue. In his FT post, Shi argued that further reducing price of solar energy will boost solar adoption, creating a net benefit across the industry as a whole. "The European solar industry employs 300,000 people, and the US solar industry employs more than 100,000 people," he wrote. "Considering that less than one percent of the world’s energy production comes from solar, imagine how many jobs we could create if that number was 25%, or even five percent." The simmering tension between China and the West over solar panel dumping is not simply an argument between free trade and state-subsidised protectionism. Both sides argue for the level playing field of free trade while simultaneously propping up their solar industries with varying degrees of subsidisation. Indeed, arguably the only major difference between Chinese subsidies and those of the West is that China has committed its state resources more emphatically and more effectively, saving solar firms from bankruptcy where the Obama administration allowed heavily-subsidised solar companies such as Solyndra and Konarka Technologies to go bust. Instead of the fruitless, often hypocritical rhetoric on free trade and protectionism, the world’s major centres of solar development should recognise the common ground that they share. Each side in the debate has channelled state assistance into local solar companies, and each side has felt the sting of oversaturation caused by cheap imports (solar panels in the West; polysilicon in China). If solar producers are not yet ready to stand on their own in a free market, governments should be working on an agreement that works for the mutual benefit of manufacturing nations and their markets, as well as encouraging more widespread adoption of solar power. For a technology this important, co-operation should be as big a part of the global equation as competition. Fairly unscathed by the disaster in Fukushima, China still has the world’s most hard-line nuclear programme. Australia and China have formed a new partnership to clean up their abundant coal supplies. They will concentrate not on how coal is mined but rather on the development of technologies to reduce emissions from fossil fuel plants.